TOKYO -- Carlos Ghosn has taken to Twitter, writing in his first post he will "tell the truth about what's happening" at an April 11 news conference, amid reports Japanese prosecutors may level fresh charges against the ousted chairman of Renault, Nissan and Mitsubishi. But if the reports about prosecutors prove true, Ghosn could be arrested once more and even detained – possibly before he has a chance to hold the press conference, his lawyer warned. Ghosn's short Tweet in English, from the verified account @carlosghosn that was created this month, came on Wednesday and was followed by a Japanese translation. "I'm getting ready to tell the truth about what's happening. Press conference on Thursday, April 11," wrote Ghosn, who awaiting trial on charges of financial misconduct during his time at Nissan. The Twitter profile photo shows the ever-dapper Ghosn in a blue blazer, proudly showing the graying locks he has sported since being released on bail. The banner picture is Ghosn overlooking a park with a traditional Japanese tile-roofed building poking between the trees. His biography box reads: "Father, Husband, Former Chairman and CEO of Nissan Motors, Renault, Former Chairman of Mitsubishi Motors, Former Chairman and CEO of the Alliance." Ghosn did not offer details about the upcoming news conference, and his lawyers were not immediately available for comment. They earlier said he expected to face the public soon. Lawyer Junichiro Hironaka said his client won’t talk legal matters. “Mr. Ghosn will not talk about specific facts about the case, not the sort of things he needs to talk about in court. Rather, I suppose he will discuss a more abstract matter,” Hironaka said. Ghosn is allowed to use an Internet-connected computer in his lawyer’s office under his bail conditions, Hironaka said. His legal team agreed to allow tweeting if they could review and approve his tweets. Hironaka said he wasn’t sure if Ghosn himself wrote the first missives. Ghosn's outreach comes as Japanese media report prosecutors are considering a new case against Ghosn, this time over payments Nissan allegedly made to a business partner in Oman. Prosecutors are discussing the move and are expected to decide soon on whether to press further charges, according to Japan's Sankei newspaper and national broadcaster NHK. The new probe focuses on results of an internal Nissan investigation that found Ghosn approved payments of $35 million from Nissan to a distributor in Oman between 2011-2018. The disbursements went to Suhail Bahwan Automobiles, which is run by billionaire Suhail Bahwan, a friend of Ghosn's, according to someone familiar with the matter. The company distributes Nissan vehicles in the region. Nissan's probe found some evidence suggesting Suhail Bahwan Automobiles may have supported Ghosn's purchase of a yacht and helped finance a company owned by Ghosn's son. 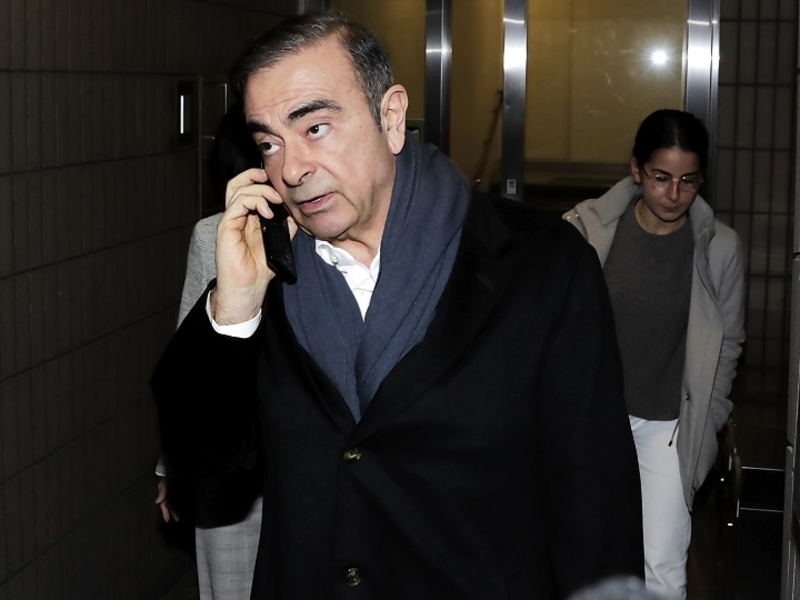 Reuters reported earlier this week that Renault had alerted French prosecutors after uncovering suspect payments to a Renault-Nissan business partner in Oman while Ghosn was chief executive of the French automaker. It quoted a Ghosn spokesman at the time as saying some $32 million were rewards for the Oman firm being a top Nissan dealer. Such dealer incentives were not directed by Ghosn and the funds were not used to pay any personal debt, the spokesman said. Hironaka said he has not discussed the Oman allegations with Ghosn. But he said adds to the legal jeopardy facing his 65-year-old client. “If the report proves to be true, Mr. Ghosn could be re-arrested and put into detention again,” Hironaka said. The lawyer cautioned that the court has already ruled that Ghosn poses no risk of flight or evidence tampering, as evidenced by its decision to grant bail. Thus, Hironaka said, it is difficult to see what argument prosecutors could make for detaining him on new charges. Prosecutors have slapped Ghosn with three indictments, two for allegedly misreporting tens of millions of dollars in deferred compensation and a third concerning alleged breach of trust. Following his Nov. 19 arrest, Ghosn spent 108 days in detention before being released on bail. Ghosn denies any wrongdoing. He faces up to 15 years in prison if found guilty. Ghosn's breach-of-trust charge alleges that he temporarily shifting 1.85 billion yen ($16.5 million) in personal swap contract losses to Nissan and had Nissan pay $14.7 million out of the CEO Reserve to a business associate who allegedly helped Ghosn handle the red ink. Nissan plans to hold an extraordinary shareholder meeting on April 8 to remove from the board Ghosn and Greg Kelly, the American director who was indicted as his alleged conspirator. Ghosn was removed as chairman shortly after his arrest, and both men were stripped of their roles as representative directors, with special rights to sign financial agreements on behalf of the company. But only shareholders can vote them off the board.